Officials with the University of Maine at Presque Isle are pleased to announce a new art installation on campus as part of the State of Maine’s Percent for Art program. The Geometric Foundations of Nature was created by Jude Valentine, a print maker, painter and University of Maine at Machias faculty member, and consists of four pieces from a 27-piece series of monoprints with digital overlays based on geometry in nature. Each piece is 36 ¼ inches high by 28 ¼ inches wide; the quartet of images have been installed on the second floor of Pullen Hall, one of the main classroom buildings on campus. Valentine began the series in 2014 during a residency at South Dakota College of Mining and Technology. Much of Valentine’s inspiration for the prints came from a desire to combine science with art, two subjects that she sees as a natural fit. 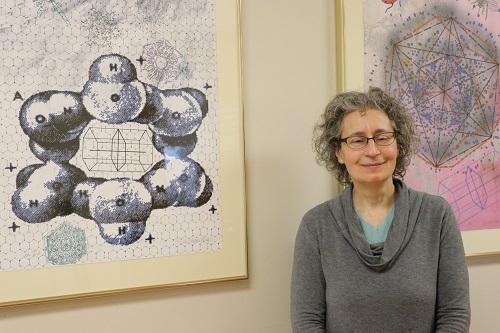 “I’m really intrigued by plants and science museum displays and there were a lot of direct connections that could be made between these displays and the works I’d done because of the way they explore science and art,” Valentine said. 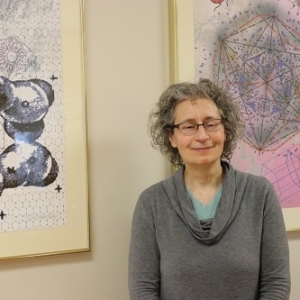 Valentine has been a faculty member at UMM for 16 years and previously created 11 paintings for a Percent for Art project at the Washington County Courthouse in Machias in 2015. She submitted The Geometric Foundations of Nature to the Percent for Art committee one year ago and the prints went through a public call and jury process before being selected for the UMPI campus. The artist calls her Percent for Art prints a culmination of a three-year process that began with her South Dakota residency and is excited for people to finally see her display at UMPI. The public is invited to view the prints on the second floor of Pullen Hall, one of UMPI’s main classroom buildings. For more information, contact the Media Relations Office at 768-9452.